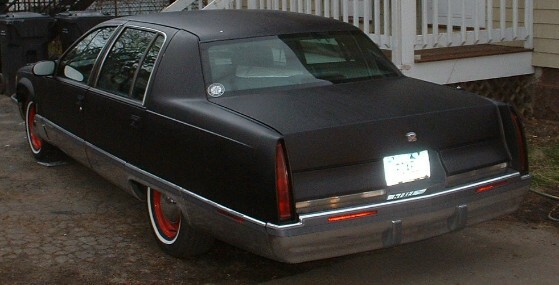 The fleetwood was pulled off the road in May of 2004 due to persistant electrical and transmission problems. I later sold it to a friend for $1000 and a V-8 engine for its replacement Scar. There are pics of what she looked like just before being retired in the Plans section. The Cat died this January of a failed oil pump, so I was in need of some new wheels. I wanted something interesting, and cheap. So When I saw an ad that started 'Pink Cadillac..' and was for a 1996 fleetwood selling for less than half it's book value I had to go look at it. I took it for a short test drive and bought it on the spot. This picture is what it looked like the day I bought it. 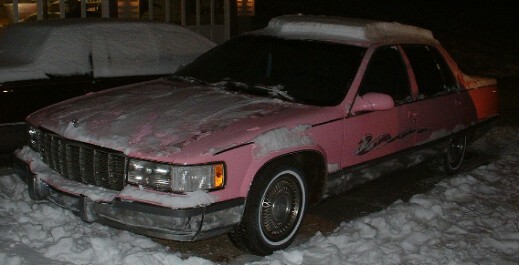 The car is a 1996 Cadillac Fleetwood. It is the last year for the full-sized rear wheel drive Cadillacs and is distinctly a throwback to an early way of making cars. She's pre-historic technology compared even to The Cat, which was 5 years older than her. However she does have the 260hp Corvette-derived LT1 V-8 engine, and a 4-speed auto transmission. So she gets up and moves when I hit the gas, and has the most lovely V-8 exhaust note (how I have missed the sound of a Chevy V-8). You can follow the links to see more of the pinkness, see her transformation check out the specifications, or the plans I had to turn her into a 50's style custom.